F1 2015 is releasing next week, and it's probably worth more fuss than last year's instalment. It's the first F1 game to hit the new generation of consoles, which means Codemasters is using a brand new engine to power it. 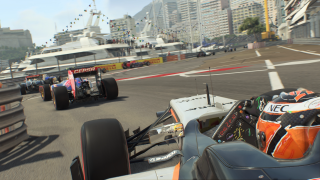 It's also the debut for the new Championship Season mode, which attempts to bring some of the drama of televised racing to the reputedly dry series. That means a 'broadcast presentation' style, as well as other attempts to make your otherwise mute driver hero a little more human. There's also the ultra-realistic Pro Season mode, which means you'll be driving looooong races in cockpit view only, without the luxury of skipping practice and qualifying sessions. F1 2015 releases July 10. Hopefully it'll prove more exciting than last year's instalment.